I remember the first time I tried this bottling in '02. Back when there was a fairly standard selection of whiskies in most bars. It really did blow me away and would have easily been a 90+ for me then. Times have changed and we are most definitely spoilt for choice, even in the supermarkets let alone specialist bottle shops, so I guess 100 is a little high with that in mind. That said out of the hundred odd people I have given a dram of this to behind the bar over the years it has never failed to impress expert and novice alike it contains so much yet is incredibly approachable. It's a real shame the new Rare old and 18 distillery bottlings don't deliver the same great taste experience in my opinion. I've got to agree with @Nozinan on this issue , I'm not disputing that it's a very good dram, what I am disputing is that it's worth a score of 100. If you come across a better whisky than the Mortlach 16 what score are you going to give it. Handing out scores of a 100 paints you into a corner and leaves you nowhere to go. What if one day you get to taste a 1937 Macallan, are you going to give it the same score as the Mortlach 16? The depth of colour in this whisky is very impressive a ruby copper like colour, very rich and enticing. The nose is sweet with molasses and clearly enriched by sherry casks, smoke is presents along with a touch of liquorish and some wood, maybe a spicy hint of clove as well. The mouth feel is full and syrupy in texture, sweet sherry flavours are massive at first but give way to more subtlety with time with cinnamon and clove spice, butter and some orange zest. The orange zest bitterness is carried through to the dry warming finish with some bitter chocolate and black coffee. As an after diner dram, or something to sip by the fireside late evening there is not much to fault here. Not much malt character but plenty of sherry goodness to enjoy. Nose: Heavy on the sherry in a very nice way, following on with a terry's chocolate orange. Taste: Sweet & syrupy with various dried fruits jumping around in your mouth, its hard to capture them all as they swirl into each other in perfect harmony. Finish: Long lovely sweetness with a smoky note running up the rear almost like a good cigar. Comments: This is an elegant & meaty sherry, a true classic speyside all rolled into one. This is a must for anyone's whisky shelve. Also getting very hard to get hold of a bottle these days since production has stopped on the Flora Faunas and what is out there is all that is left. Nice review - I bought a bottle of this when I visited Dalwhinnie distillery a couple of years ago. I did really like it and consider it a hidden gem but not sure I'd score it that highly, (though I am more Islay than Speyside). Might have to get myself another bottle soon however. Well, I'm on a roll tonight. My friend was sick so my going-out plans turned into staying-in plans. So I'm on my third review tonight, burning through some samples that I have on hand. The last two were both matured in what I am sure are second- and third-fill bourbon casks, so I'm changing it up with this sherried classic: the 16 Year Old Flora & Fauna Mortlach (which I've never tried before). This sample came to me courtesy of Richard Culver. James Findlater became the first licensed distiller in Dufftown in 1823. Of course, many more distilleries popped up in Dufftown, and in Speyside as a whole, over the course of the next hundred-or-so years. It is used a lot in Johnnie Walker (having been owned by Diageo since 1925, when they were called DCL), which you can tell right off the bat when you sample it - hence the few single malt bottlings available. In fact, would you believe that the first single malt bottling was not until 1995 (Rare Malt 22 Year Old)? One of the unique features of the distillery is that 1/5 of the spirit is triple-distilled in an intermediate still called "Wee Witchie" (I see a whisky-horror-movie script in the making...) This, combined with the traditional worm tub condensers and the sherry cask influence, creates a very old-fashioned style of whisky. The colour is ruby copper, as befits the cask; the nose is faintly herbal, with more subtlety than I was expecting: stewed prunes, raspberries, red wine (I don't know enough about wine to be more specific) - nicely sherried. A trace of sulphur which, on the nose, isn't too bad. A little water brings out some raisin and brown sugar - sort of like a sugar pie. This bottle costs $108 in Oregon. Sounds like it's not worth it. 83 is a pretty low mark, at least in my book. Thanks for the review, Tal. I've never tasted a Mortlach before. Frodo: [Examining the ring] Wait... there are markings. It's some form of Elvish, I can't read it. Gandalf: There are few who can. The language is the that of Mortlach, which I will not utter here. Very interesting review, @talexander. Those of us who are more sulphur sensitive, like I am, will definitely sample a malt like this one before considering a purchase. I like my sherried malts to have a very clean sherry,...though I do like Bowmore Darkest, which is murky as hell. Sulphured and overly tannic sherries just don't do it for me in a malt whisky. This 16yo is the first own bottling (OB) I've bought and I have to say it's great stuff. Beautiful mahogany colour, a classic sherried Speysider like Aberlour Abunadh rich and inviting. On the nose I am finding mint tea, rosewood, artisan furniture polish? mocha, butterscotch, lemon, lime and beeswax. The arrival is rich and complex with more beeswax, coffee, plums, citrus and a light sherbet fizz..the finish is licorice, limes, sherry and teak-oak and more plums.. This reminds me very much of Hibiki 12 yo but with more depth and substance. A drop of water brings out more aromas (floral) but with or without is very good. Feels like tasting something rare and unique. Mortlach 16 year old flora and fauna is in our winter warmers tasting pack. Tony writes: The vast majority of the production of up to 2.8 million litres at Mortlach goes into Johnny Walker Black Label. Because of this, Mortlach has a very low profile as a single malt; it does not even have a website. There are only two official bottlings: this 16 year old which forms part of Diageo’s flora and fauna range and a very expensive 32 year old. Of course, whisky fans know all about it and there are many independent bottlings, but I find it odd Diageo do not promote it more as OBs. 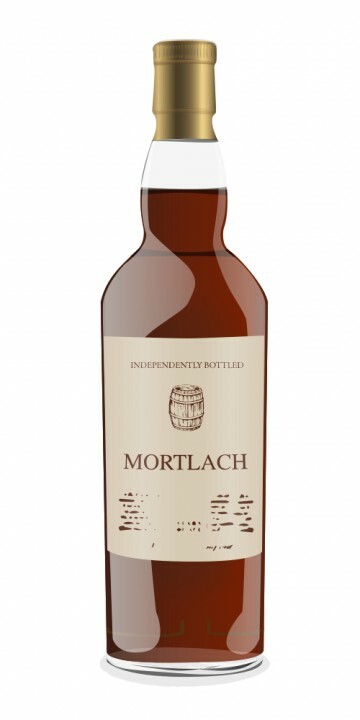 Mortlach is an elegant sherried whisky full of the taste of Christmas cake. Ideal for a cold winter’s night. I'm generally not a big fan of sherried whiskies but I love this. None of the harsh notes I seem to commonly get with sherried whisky, all the sweet warming. Pat's notes: Nose: Coffee, Blackcurrant, Oranges, Big, heavy sherry, butterscotch sauce. Dry and dusty. Taste: Rich sherry, ripe grape, liquorice, brazil nut. Spices held in check, with a slightly drying and minty finish. A brilliant malt indeed! Very well balanced and excellent finish. A couple of years ago, under the pretext of a conference in Edinburgh about Italian Literature, we bought this Mortlach, our very first bottle of whisky: since then, nothing has ever been the same. It seems that in his Whisky Bible Jim Murray is not so kind with Mortlachs, often alluding to the high regard that these whiskies have in the German market: and he doesn't seem to consider it a point of glory. Let's see. N: quite pungent and rich. First you have, guess what?, sherry and malt and a far acetone; after a while, a sweet soft smokiness arises; it reminds me some of those mild and sweet pipe tobaccos (not the artificially aromatized). Then, there are some of the typical sherry influences: dried friut, raisins, maybe Smyrna figs. Whiffs of demerara sugar. Quite nice, it starts with sweetness but develops towards a slightly more bitter profile (creme brulée? ); red fruits. B: very soft: at first (and I am a bit surprised, I must say) it's really on bitter notes, with some wood involved. It quickly goes sweet, and this is probably the most satisfying experience in this tasting: red fruits, currants, again dried fruits, even dates if I am not wrong. The pipe tobacco comes back reminding those smoky and woody notes we had on the nose, plus again brown sugar (not heroin!). Reminds of some sweet southern wines (Marsala), in a positive way. F: dry and not so long, even if wood and a gentle smokiness try to stand. Very soft notes of red fruits. Even if it is not that complex, it surely is a very nice and enjoyable after-dinner malt. It seems a perfect introduction to sherried whiskies. Thanks for the review. I've been looking and looking for the F&F Mortlach 16 for many years now. Your review only makes my quest more epic! Nose: Big sherry, sweet tea and lemons, peppermint (specifically altoids), cinnamon, grapes, caramel. Taste: Sherry, rum raisin cake, maple syrup. Elegant. Finish: Sweet, spicy, and long. The very end of the finish gives me the feeling that I just finished a cigar. I've had tobacco notes turn up in whiskies before but this is especially noticeable. This one seems older than 16 years. I would have guessed somewhere around 20-25 years old if asked blindly. It really is a great whisky that is very interesting. The undefinable "meatiness" that people talk about when referring to Mortlach is definitely present. Additionally, the tobacco note at the end is very distinct and great. Perhaps this is sulphur from the sherry casks? I'm not sure, but if it is, I don't find it to be unpleasant at all. On the contrary, I think it is very engaging and unique. Recommended. I have to say the Mortlach Flora & Fauna 16yo from Diageo is flawless. It's almost a crime that it has been denied its place in The Classic Malts range. The whisky is matured for 16 long years in sherry casks. The nose is rich sherry and sumptously fruity christmas cake, on the palate there is a rush of plums, sweet summer fruits, mouthwatering melons and warming spice, the finish is long rich fruity with just a hint of liquorice maybe even a glimmer of sulphur, but thats easily overlooked. Can sulphur be an accepted part of a whisky's flavour profile? Interesting! I have a bottle in the mail and I absolutely can't wait. Sounds like a great dram.